We, the pastry team of Diamond Hotel Philippines, offered our culinary expertise in line with the celebration of 150 years of Jose Rizal. As I, Pastry Chef Daniel Back and my sous-chef Robert Mempin decided on a form this celebratory cake would take, I remembered seeing the original copy of his first book ‘Noli Me Tangere’. Inspired by this powerful image, we set to work. Initially, we made a large Supermoist Cake, this being one of the most popular cakes we sell at the hotel’s tea lounge Kohikan and our patissiere in the Power Plant Mall, Makati called The Cake Club. The Supermoist Cake is a dark and luxurious chocolate cake covered with chocolate ganache and finished with chocolate shavings. We started by alternating 3 layers of dark supermoist chocolate sponge cake and chocolate ganache. Then we rolled out the white fondant icing, primarily used for wedding cakes, and carefully placed it over the cake. The cake was made to ‘rest’ overnight in our chocolate room which is usually reserved for house-made pralines and bon-bons. 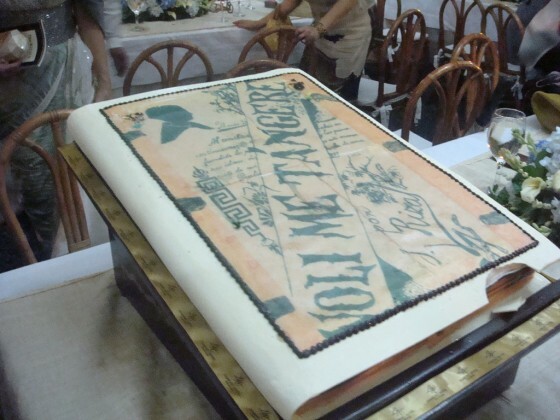 In the morning, a scanned version of the Noli Me Tangere book cover was printed on edible paper using edible ink was placed over the cake. The sides were then framed with white chocolate and the book binding was made from white chocolate as well. To secure the edible paper, the sides of the paper were bordered with dark chocolate. Once the image and cover was in place, we placed the cake on a custom-made wooden plinth similar to the Rizal stand ready for transport to Fort Santiago in Intramuros. While Chef Robert and I were preparing the commemorative cake, the rest of the pastry team produced over 100 petit Noli Me Tangere cakes complete with the same artwork. 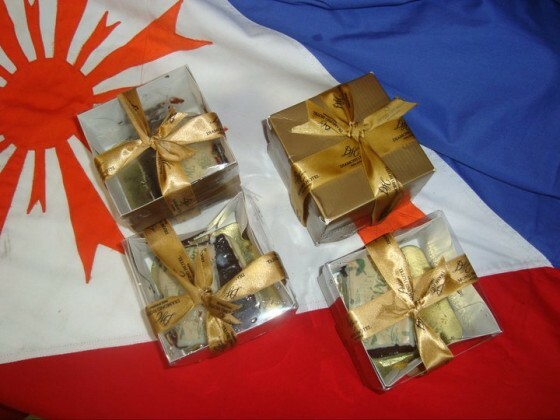 These cakes were given to the Descendents of Jose Rizal and other important guests. In all, the special Noli Me Tangere cake took us 2 days to create. It was a pleasure to be a part of this historical celebration in honor of the 150 years of Jose Rizal. 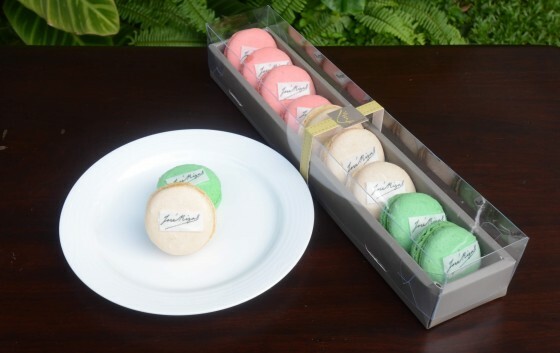 Diamond Hotel's "Noli Me Tangere Cake"
Mini Noli Cakes. Photo by Pedro Javier.